Download and install Microsoft Windows SDK v7.1. Download and install Unix command-line tool Cygwin. Download and install Maven 3.1.1. Download Protocol Buffers 2.5.0 and extract to a folder (say c:\protobuf). 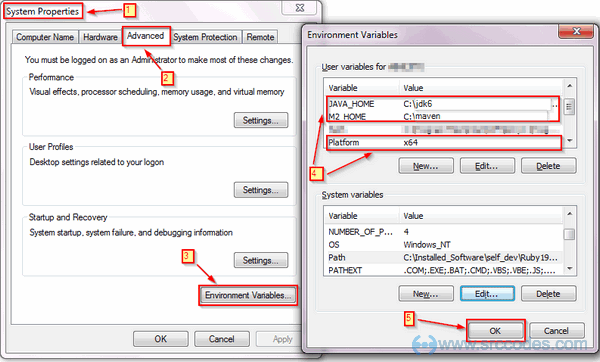 Add Environment Variables JAVA_HOME, M2_HOME and Platform if not added already. Variable name Platform is case sensitive. And value will be either x64 or Win32 for building on a 64-bit or 32-bit system. If JDK installation path contains any space then use Windows shortened name (say 'PROGRA~1' for 'Program Files') for the JAVA_HOME environment variable. Edit Path Variable to add bin directory of Cygwin (say C:\cygwin64\bin), bin directory of Maven (say C:\maven\bin) and installation path of Protocol Buffers (say c:\protobuf). Download hadoop-2.2.0-src.tar.gz and extract to a folder having short path (say c:\hdfs) to avoid runtime problem due to maximum path length limitation in Windows. Select Start --> All Programs --> Microsoft Windows SDK v7.1 and open Windows SDK 7.1 Command Prompt. 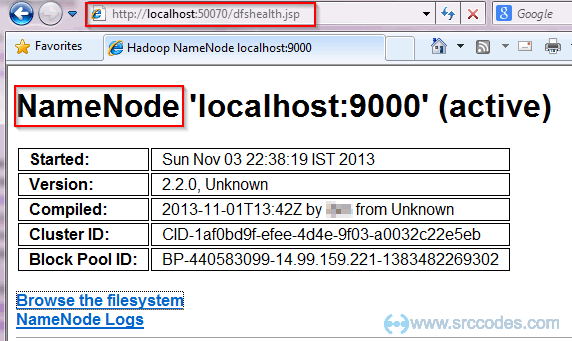 Change directory to Hadoop source code folder (c:\hdfs). 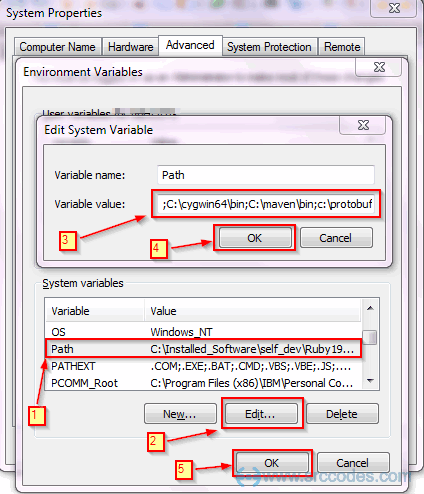 Execute mvn package with options -Pdist,native-win -DskipTests -Dtar to create Windows binary tar distribution. Note : I have pasted only the starting few lines of huge logs generated by maven. This building step requires Internet connection as Maven will download all the required dependencies. If everything goes well in the previous step, then native distribution hadoop-2.2.0.tar.gz will be created inside C:\hdfs\hadoop-dist\target\hadoop-2.2.0 directory. Extract hadoop-2.2.0.tar.gz to a folder (say c:\hadoop). 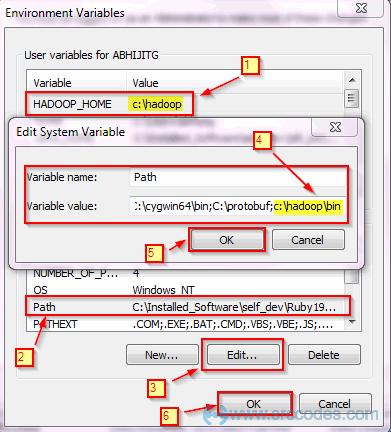 Add Environment Variable HADOOP_HOME and edit Path Variable to add bin directory of HADOOP_HOME (say C:\hadoop\bin). 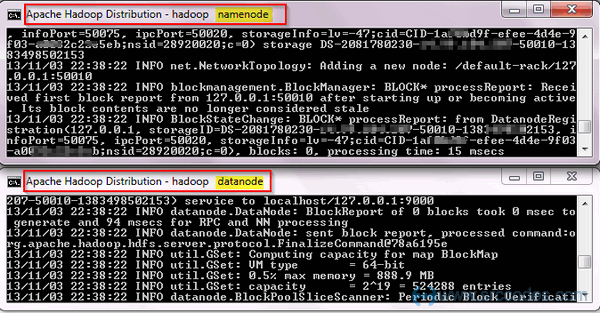 Note : Create namenode and datanode directory under c:/hadoop/data/dfs/. For the first time only, namenode needs to be formatted. 13/11/03 18:07:49 INFO common.Storage: Storage directory \hadoop\data\dfs\namenode has been successfully formatted. f size 200 bytes saved in 0 seconds. 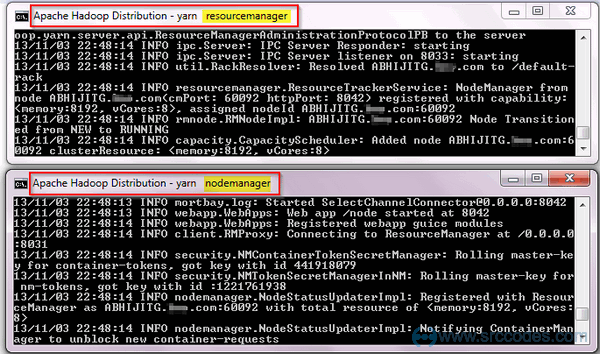 Similarly, two separate Command Prompt windows will be opened automatically to run Resource Manager and Node Manager. SUCCESS: Sent termination signal to the process with PID 876. SUCCESS: Sent termination signal to the process with PID 3848. SUCCESS: Sent termination signal to the process with PID 5920. SUCCESS: Sent termination signal to the process with PID 7612.